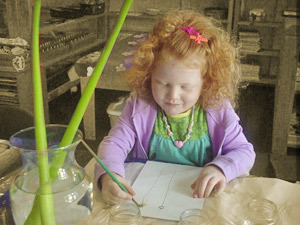 BGP offers a wide variety of stimulating activities that invite children to explore and discover. The curriculum includes language experiences, imaginative artwork, structured and unstructured play, cooking projects, creative movement, and in-depth science exploration. Meaningful experiences are provided for children to learn more about themselves, their families, other cultures, and their communities. Developmentally appropriate learning materials are laid out in the classroom so children can be self-directed in task decision-making. BGP uses a variety of instructional materials including: educational manipulatives, selected Montessori manipulatives, art materials, musical instruments and CD's, books, puzzles, dollhouse, and toys that test spatial relations.